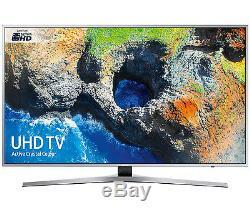 SAMSUNG UE65MU6400 65 4K Ultra HD HDR LED TV. 2 x Remotes (Including Smart Remote). Active Crystal Colour joins HDR to give the Samsung UE65MU6400 a class-leading picture. Discover a wider colour range that feels so real with our Certified Ultra HD Active Crystal Colour technology. See the beautiful shades of a sunset or the rich tones of the latest action movie. With over 17 million colours and striking contrast, discover a viewing experience unlike any other. See impressive brightness, shadow detail and authentic colour. Watch as every scene bursts from the screen through the combination of Active Crystal Colour and High Dynamic Range. With HDR+, striking brightness, exceptional shadow detail and vividly accurate colour give depth and life to whatever content you're watching. Experience Certified Ultra HD for true colour and clarity. With over 17 million stunning colours, Certified Ultra HD makes the most of every pixel. Don't settle for anything less than Certified picture quality, guaranteeing you the true hues and sharp contrast you would expect from the latest resolution standards. Control all of your compatible devices and content with the One Remote Control. Experience complete control, seamless multi-tasking and laid-back viewing as you change channels on your set-top box, play the latest blockbuster on your Ultra HD Blu-ray player, ramp up the audio on your soundbar or simply surf the web on the big screen. Easily browse content and control your TV from your mobile. Effortlessly connect your compatible mobile device with your TV to stream the latest viral sensation. You'll never miss a moment as you make a cup of tea. Challenge your friends and play games, using your mobile device as a controller. You can even search for your favourite content without disturbing what you're watching. Easy access to all your content and connected devices from one place. Discover must-have entertainment through Samsung's intuitive 2017 Smart Hub. From late-night Netflix marathons to bingeing on UHD box sets, you're only ever 3 clicks from your favourite content. Use S Voice on your remote to talk to your TV. The Samsung Smart TV platform is used by Content Providers to make apps available. Content Providers may remove apps from the Smart TV platform or stop supporting them at any time. When new Samsung Smart TV products are launched, there may be a delay before the apps become available on those products. Play world famous streaming & PC games on your TV. Access the latest titles, play old favourites and discover a whole world of entertainment through cloud gaming without the need for a console. Turn your front room into your own personal arcade, and take gaming to the next level! Experience easy access to the latest movies via your TV guide in addition to all your traditional TV channels. Whether you're browsing for the latest Hollywood blockbuster or trying to find Ultra HD content, expand your viewing options through a wealth of additional Smart channels with Samsung TV Plus. We specialise in Samsung products at ludicrously low prices. You will also find Smart TVs, 3D TVs and the latest range of LED Smart 3D TVs. We are always getting in a fantastic selection of Televisions, Home Entertainment Systems, BD Players and other varieties such as tablets and phones. So, you will find the latest products still currently available on the high street with huge discounts. We pride ourselves on running a business with an unprecedented after-sales service which is the envy of many other retailers. We are confident that no-one can match our combination of low prices, product knowledge and excellent customer service. Please note: Our items are licence and property of The Electronics Warehouse and not Samsung. Therefore, Serial Numbers may not be included with your item and they do not carry any Samsung benefits. All credit/debit card holders are subject to validation checks and authorisation by the card issuer. Best prices & quality service We constantly monitor prices to bring you the best value in electrical goods. Our team of "price checkers" check prices daily against other leading online retailers and endeavour to ensure that our customers receive the lowest available prices. We will also treat you as an individual and we pride ourselves on our high standard of service. These items are no longer property of Samsung, therefore do not hold any Samsung Benefits. Serial Numbers are removed on all of our products before we receive them in our Warehouse. S/N maybe blanked out, rubbed off, or scratched off. TVs will not have the white label with model details on the back. We deliver goods to destinations within the UK Mainland Only. We do not deliver to any part of Ireland, Isle of Wight or Isle of Man. All parcels we send are insured at no extra cost. Please provide proof of I. D to the driver if requested. We shall not be liable for any losses, costs, damages, charges or expenses caused by any delay in delivering goods. Collections are to be booked at least one day in advance. We have the right to cancel a booking at any given time, though if item is unpaid, customer will be notified beforehand. If item is pre-paid it will be already packaged upon collection and we only work as a tradepoint. All collections must have some form of I. If viewing on a mobile device, customer will need to press'see listing' to view. We do not include HDMI leads or Optical cables with any of our products and these must be brought separately. User manuals may not be included; however you can download these free from the Samsung website. We will then contact you and attempt to resolve the issue remotely within 48 hours. The customer must follow any given instructions in resolving the issue. If all possible solutions have failed, a return will be required. Following inspection, a decision will be made on whether it is economical to repair the product, or whether it is replaced with an equivalent item. Repairs are completed as expediently as possible, and usually within working five days. All repairs are fully tested for 48 hours to ensure that any intermittent faults have been rectified. Developing light or dark patches. Any form of physcial damage such as a screen or bezel crack which was not notified upon received item. A blown mainboard due to the connect box (on connect box required TVs) being plugged in incorrectly. If your TV will not switch on after plugging in the connect box, you must send over a clear picture of the TV slot showing the inside. All original packaging should be kept for your product as this is required for returning the item to us. We're not liable to provide any further packaging. It is the customers responsibility to package the item in a safe way with the original polystyrene and original box suitable for courier transport. The courier will not collect if you do not have the original packaging. The item must be in an unused condition, with all contents and with the original packaging. Following The Consumer Contracts (Information, Cancellation and Additional Charges) Regulations, we will accept items back even if you have opened the goods to inspect them. After the 30 day period, we only offer a repair and/or replace service if item has developed a fault. If an item does require returning, it is the customer's responsibility to package the item securely. After the 2 month period we do not cover the cost of returning an item. If the customer fails to be present upon collection resulting in a failed collection, then the customer must notify us and is responsible for paying any additional re-collection charges. Printing & pricing errors In the event a product is listed at a wrong price due to a typographical (human) error or incorrect pricing information received from our suppliers, we have the right to refuse or cancel any orders placed prior to a contract being made. Additionally we also ensure that your credit, debit or charge card is not being used without your consent, we will validate name, address and other personal information supplied by you during the order process against appropriate third party databases. By accepting these terms and conditions you consent to such checks being made. In performing these checks personal information provided by you may be disclosed to a registered Credit Reference Agency which may keep a record of that information. All information provided by you will be treated securely and strictly in accordance with the Data Protection Act 1998. Refurbished means the TV has been checked restored to factory settings and is in 100% working condition. What is the item condition? The item condition will be stated on the listing, if it does not state on the listing that the TV has a scratch or mark then the screen will have no marks or scratches. The TV may however have the odd mark on the back of the TV as it will have been plugged in a few times and removed from the box. Full details will be available on the listing. TVs which has significant marks will have photos included. This is to ensure your TV arrives safely. What if I'm not in when my item arrives? When expecting any item it's important the couriers have your contact number as they will contact you regarding a time slot. We cannot be held responsible if the courier does not have your mobile to contact you. Can I collect my item? No, we do not provide that option. Is there any movement on price? We list all TVs at the best possible price so that they sell, as we don't like to hold on to stock. We only have one member of staff who deals with emails during the week. Please allow up to 2 hours for a response. Will it be in the original box? All TVs will be in original boxes unless stated on the listing. Will my TV include both the Smart and regular remote? If the Unit is supposed to have x 2 remotes then these will be included unless stated otherwise. The Electronics Warehouse Ltd Unit 1b Barton Hill Trading Estate Herapath Street Bristol BS5 9RD. The item "SAMSUNG UE65MU6400 65 inch 4K Ultra HD Smart HDR LED TV TV Plus" is in sale since Tuesday, February 6, 2018. This item is in the category "Sound & Vision\TVs". The seller is "theelectronicswarehouseltd" and is located in Bristol, Gloucestershire.